I have been hearing a lot about the new barbecue restaurant SmoQ (warning, they have a VERY annoying website, turn down the volume before clicking). First I read a glowing review from notoriously picky (meant as a compliment) WineMeDineMe, and then just recently Cincinnati Nomerati added her praise. So when I found myself up that way for lunch today, I had to give it a try. Normally, I want to give a place a number of tries before writing a review, but in this case I am making an exception. I definitely plan on visiting this a few more times and giving it a thorough review, but they have killer deal this month I want to inform you of, so I wanted to add thoughts from my first visit. 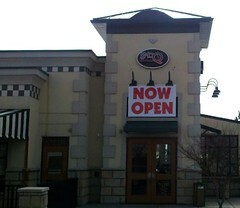 For February, they are offering 1/2 off sandwiches and salads from 11-2 M-F. I was debating trying the St. Louis Ribs Wine Me Dine Me recommends, but half-off a pulled pork sandwich was way to attractive to pass up. 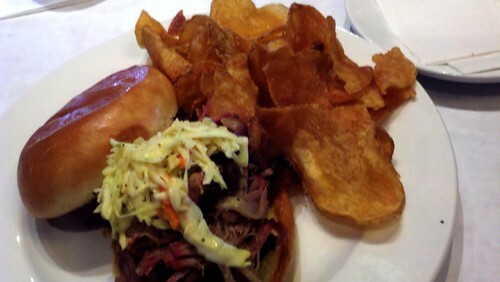 The sandwich comes on a nice bun with cole slaw and their own hickory chips. I am only a recent convert to the cole slaw on pulled pork club, but I went with it this time, and it was very nice. It also comes with something they call corn bread. A better name would be corn cake. I am not a fan of sweet corn bread, but I know some are. It reminds me of Burbank’s cornbread that folks used to rave about. Again, I am not a fan. The pork had a really nice smoke ring, and very good flavor. I found portions of it a little on the tough side, but all in all, really good. They have three sauces on the table. They have a Kansas City Sweet, Memphis Medium and Carolina Hot. I prefer my BBQ sauce on the vinegar and mustard side of the scale, so chose the Carolina Hot. It was very good. The only negative besides the corn “bread” was that they are a Pepsi place. On the other hand, since I went with water, and sandwiches were half-off, I had a great lunch for $3.99. 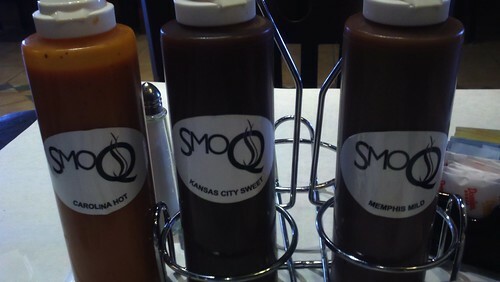 So, if you have heard the buzz, and have wanted to give it a try, this is a good week to hit up SmoQ for lunch. M-F, 11-2 for February you can try a sandwich, or salad for half-price. What are you waiting for?